Summer in the city has a uniform, and it’s called sweat. Congratulations! You’ve got the look. The problem is that it’s not very chic, nor does it feel very cool. 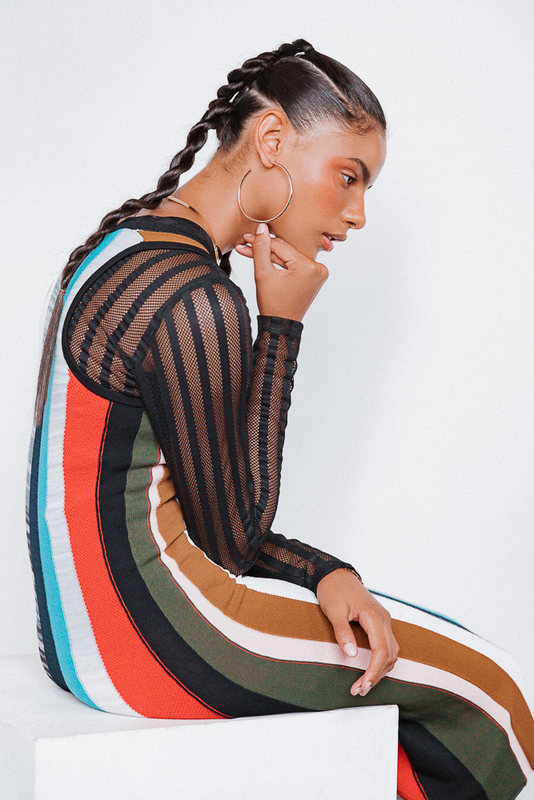 But if you can forget the forest of baby hairs glued to your forehead for a minute, take a look at hairstylist Joey George’s solution to the aforementioned uniform. “It’s about working with your texture and embracing your individuality,” he says. “And then adding that little quirky piece that gets the hair out of your way for sweaty summer months.” It doesn’t take much–a little pomade here, a little hairspray there. Here, he demonstrates on model Mileshka Cortes. “You can get rid of the majority of your hair and still keep your look,” says Joey. “Braid it on the beach–your look is locked in for the week.” Cool, the other kind of cool, and low-maintenance. What better way to enjoy summer? Mileshka wears a Kenzo jacket, stylist's own top, Public School shorts, Nike shoes, and Jennifer Fisher jewelry. Mileshka wears a Public School top, Ellery pants, and Maryam Nassir Zadeh shoes. Mileshka wears a Cinq à Sept bodysuit and dress, Maryam Nassir Zadeh shoes, Tuza chain, and Jennifer Fisher earrings and bracelet. Mileshka wears a Stella McCartney blazer, Nike shoes, Laura Lombardi earrings, and Hirotaka ear cuff and rings. Mileshka wears a Christopher Kane top, Frame Denim skirt, Tuza Jewelry earrings, Laura Lombardi necklace, and Hirotaka rings. Mileshka Cortes (Elite) photographed by Tom Newton. Hair by Joey George [Streeters]. Makeup by Shayna Gold. Styled by Tchesmeni Leonard. Your summer shopping list wouldn't be replete without a face mist or two. Read here for some of the best.